The city of San Francisco and the surrounding Bay Area embody many different landscapes, from urban to suburban to rural. The area is famous for its world-renowned culture, iconic landmarks, and breathtaking views. 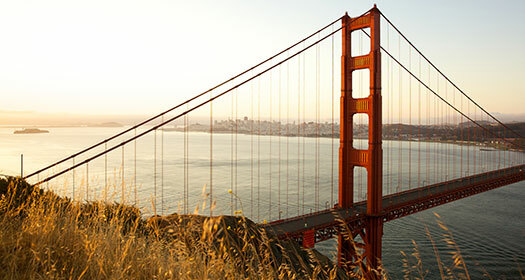 Get lost, in a good way, in the majesty of San Francisco. San Francisco consistently ranks as one of the happiest, healthiest, and fittest cities in the country. It's not hard to understand why with all the active opportunities the city offers. Experience some of the country’s best public parks like Golden Gate Park, the Presidio, and Mission Dolores Park. Go for a hike without leaving the city by checking out Glen Canyon Park, the Bay Ridge Trail, Mt. Davidson, or Lands End. Get around on two wheels. San Francisco is one of the top-rated biking cities. Cruise through town via shared bike lanes or bike trails. This vibrant city and its diverse cultural influences can be sensed in every corner of its 49 square miles and beyond to the Bay Area. The city is always bursting with things to do like live music, art, theater, and more. Tour the murals of the Mission District's alleys and buildings where you'll find over 200 distinct murals, many reflecting the neighborhood's Latino heritage. Touch, tinker, and play with more than 650 hands-on exhibits at the Exploratorium. The immersive art installation, Fog Bridge, is always a fan favorite. The Beat Generation found its voice in San Francisco. Visit City Lights, where Allen Ginsburg's Howl & Other Poems was first published, to catch up with today's indie-literary voices. The proximity of the freshest ingredients and competitive creativity of the chefs result in unforgettable dining experiences throughout San Francisco. There are endless ways to fill up, but here are a few highlights.